The KER HELEN camping village is a few kilometres from the great dune of Pyla. 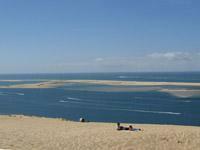 This is the tallest dune in Europe. It extends 500m from east to west and 2.7km from north to south.